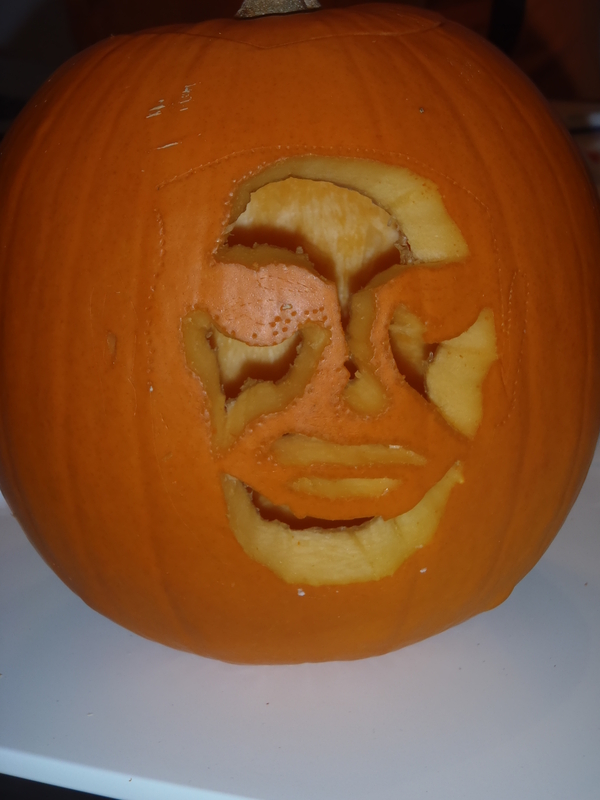 With lots of time on my hands, I decided that I would do something special with my pumpkin for Halloween. 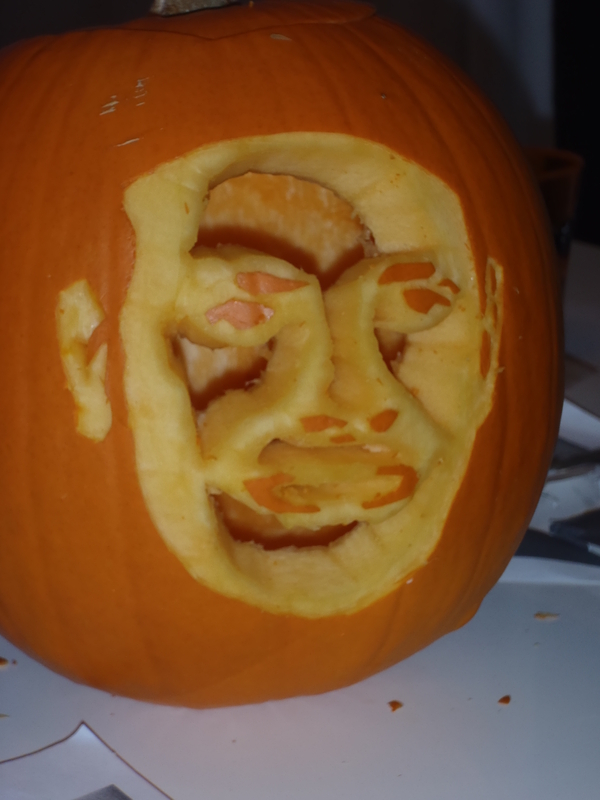 The idea was simple… Would I be able to carve my own face onto a pumpkin? This post tells the story of my endeavour, and by the end of it I’ll let you be the judge as to whether I was successful. 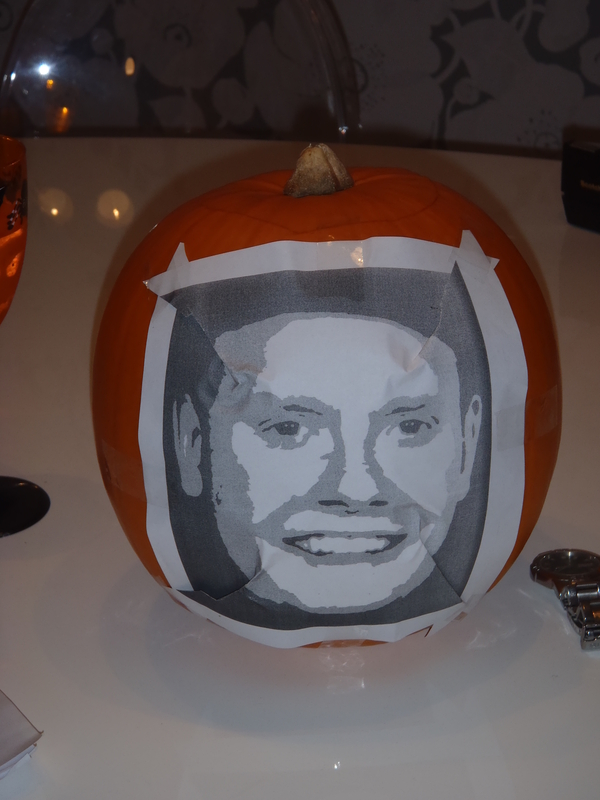 In order to get any sort of design onto the pumpkin, the main job is to create a template of the design that you want. 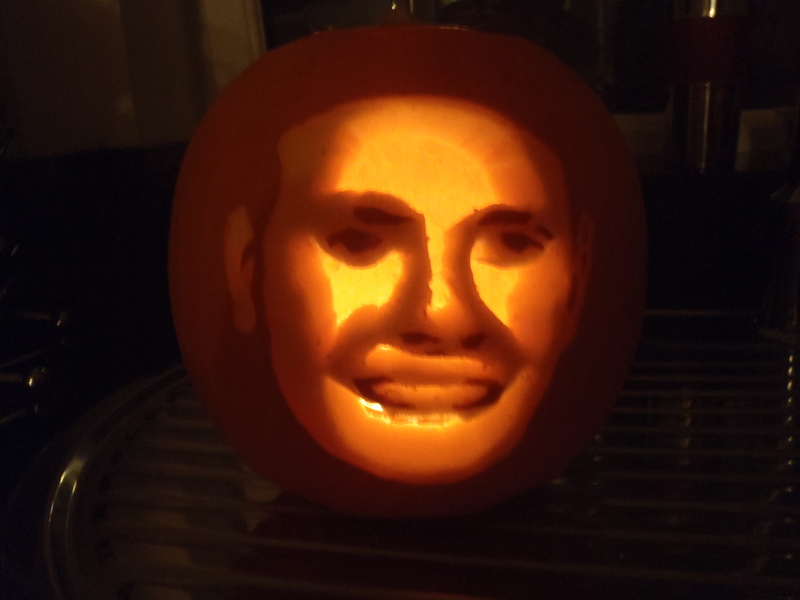 The first challenge is to chose what design you want, which was easy for me as I had already decided that I would carve a picture of my own face. The next step was to find a suitable picture that could be used to make a good template. Keeping in mind that the final design can only use three shades, it is necessary to find a picture that can be converted into a three level grey-scale and still keep its features. 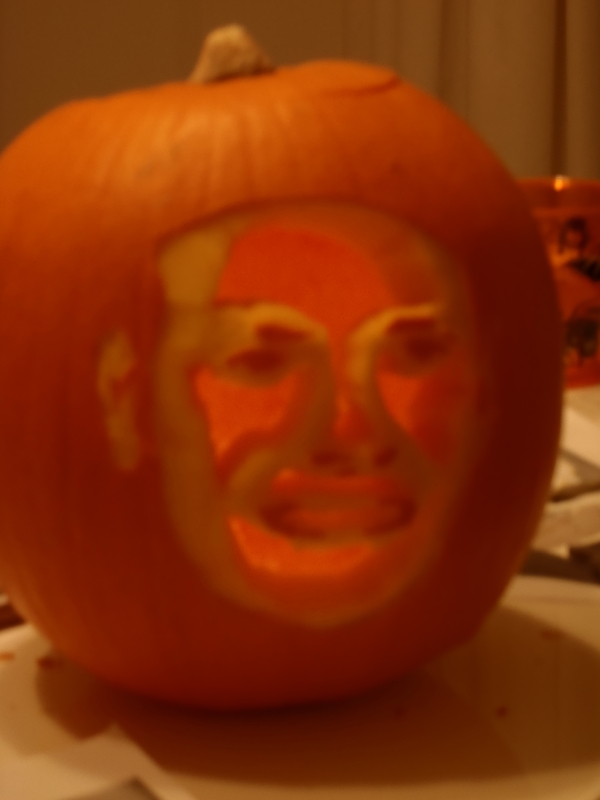 In the final carving, the lightest areas will be made by carving out complete holes, the medium areas will be made by removing just the skin of the pumpkin, and the darkest areas will be left with their skin on. The main thing to keep in mind, is that the final pumpkin is only likely to work when lit from within by a candle, and sat in a dark room. After a little bit of searching, the best hints I could find were to use a photo that is well lit from the front, but with a plain dark background. 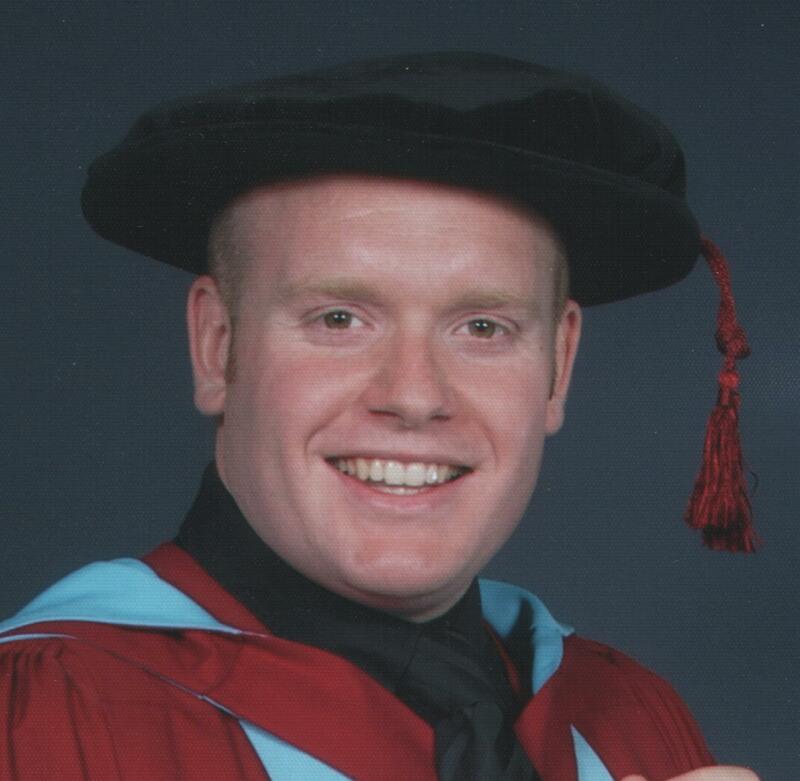 Luckily for me, I had a recent photograph that fulfilled that role: the professional photography from my graduation. So, cropping the picture so as just to show my face, I was left with the following starting point for creating my template. Now comes the Photoshop skills, or in my case GIMP skills. You need to convert the image into grey-scale, and then “posterize” it down to only 3 levels of grey. If the resulting image isn’t very good, then playing around with the contrast and brightness of the image, before posterisation, can help. 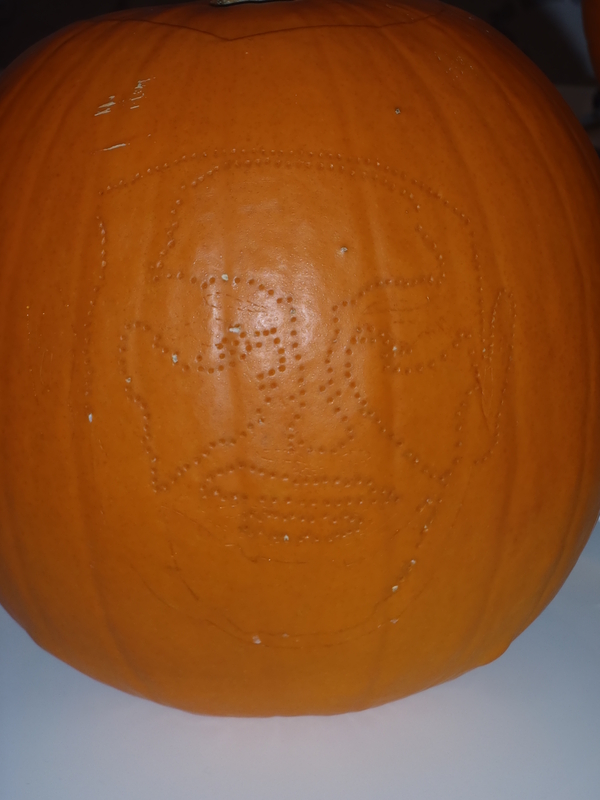 You also have to remember that the template will have to be carved into a pumpkin, so you cannot have any dark or medium areas “floating” within light areas. 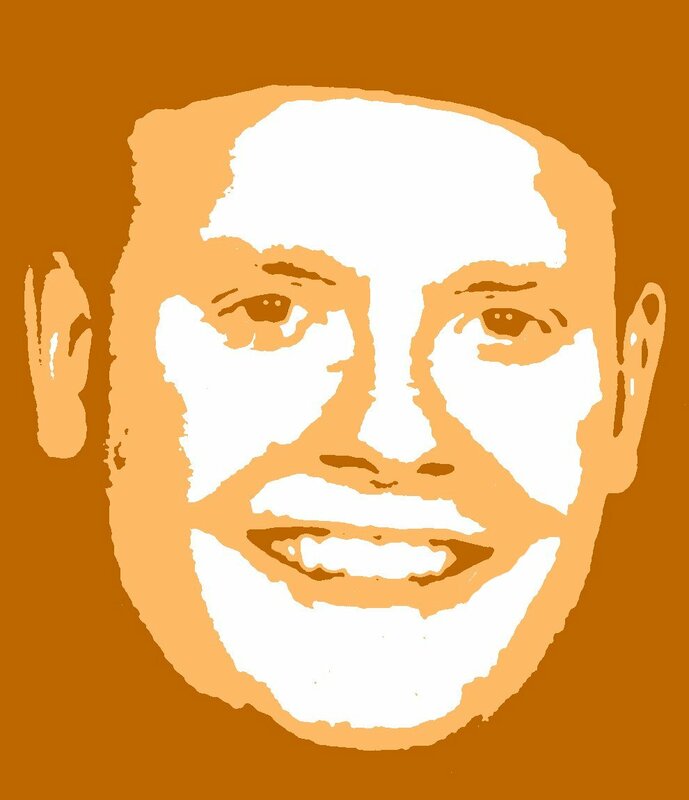 I have changed my 3-level grey-scale image into a 3-level orange-scale image, to add a pumpkin colour theme to the template. 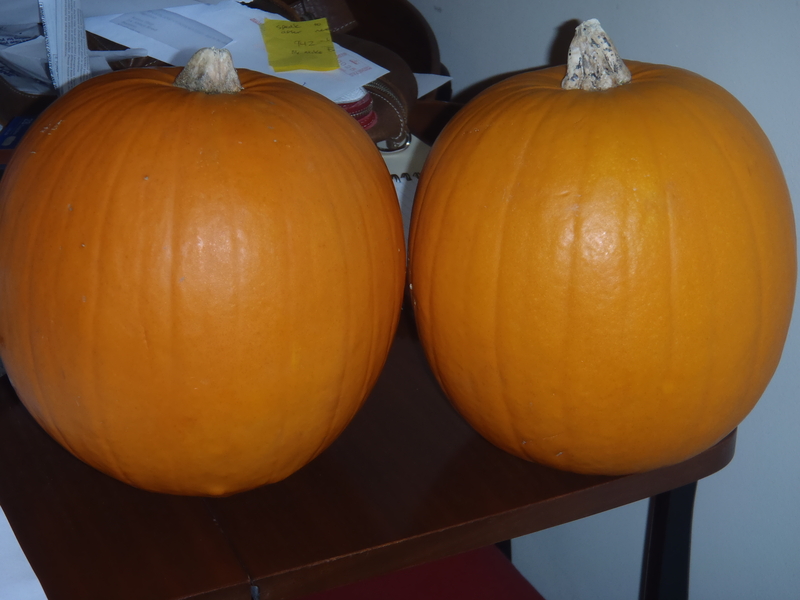 So, with template in hand, I only had to choose a pumpkin from the green grocer’s, attach a print out of the template, and transfer the layout onto the pumpkin. Then the relevant parts of the design could be cut out or skinned. 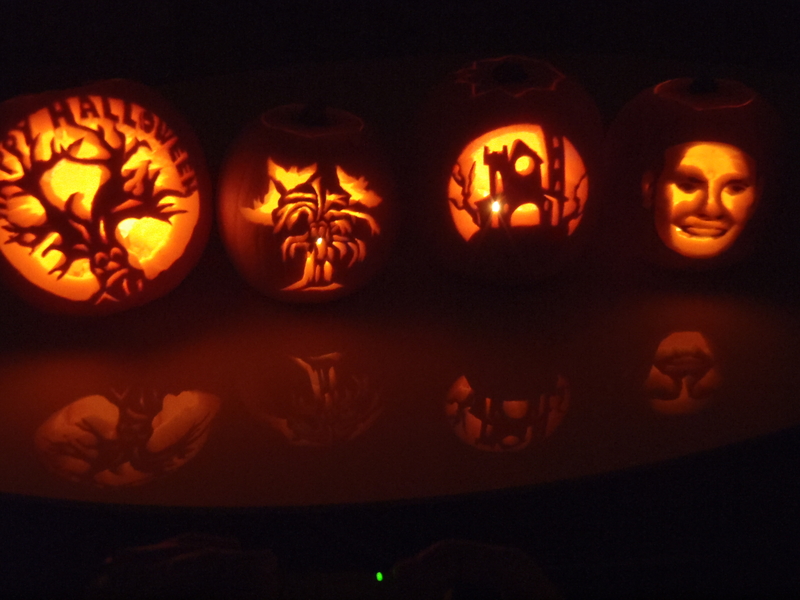 I’ll end this post with a photo of the finished pumpkin, lit up with a candle, and placed in a dark room, and a photo of it sat amongst its Halloween pumpkin peers. One thing that I like to do these days is to log my whereabouts using the GPS device in my phone. I have a HTC Hero, and the My Tracks application for Android, which is made by Google, does exactly what I want in this respect. I used to have a Bluetooth GPS device, and log the tracks on an IPAQ in raw NMEA format, but the GPX and KML formats that are created in My Tracks are much more widely used these days. I do plan to go through all my old logs and post any interesting results that I come across, but for now I shall just give a simple example of the type of thing I like to do. Earlier this year, I went skiing in Saas Fee, which is in Switzerland, and carried my phone with me to log my skiing tracks. Over the whole week I tried to do all the pistes that were available, and enjoyed using the logs to see where I’d been, and how fast I’d been able to ski etc. As an aside, my max speed over the whole week was 54 mph, which made me pleased that I have started to wear a helmet! Once I was back in the UK, I was able to load all the logs from the week into Google Earth, and plot them in 3D by having the Terrain layer on. 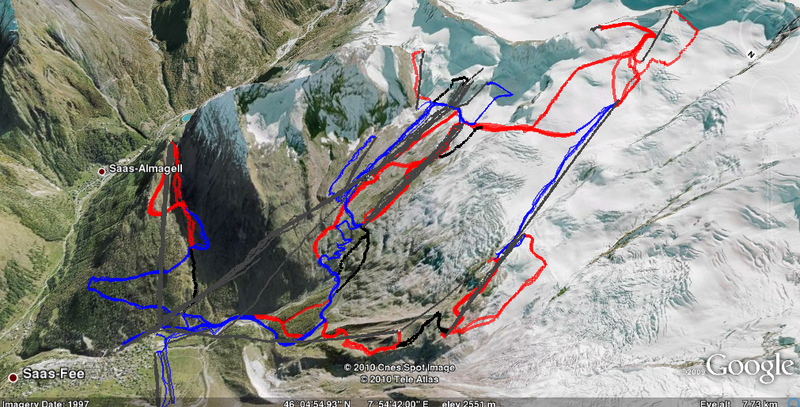 I do plan to split the tracks into the various pistes and lifts that are in the resort, and colour them accordingly, but for now the plot of all my tracks can already be compared with the piste map. Bonus points for any comments on which pistes must have been closed while I was there! 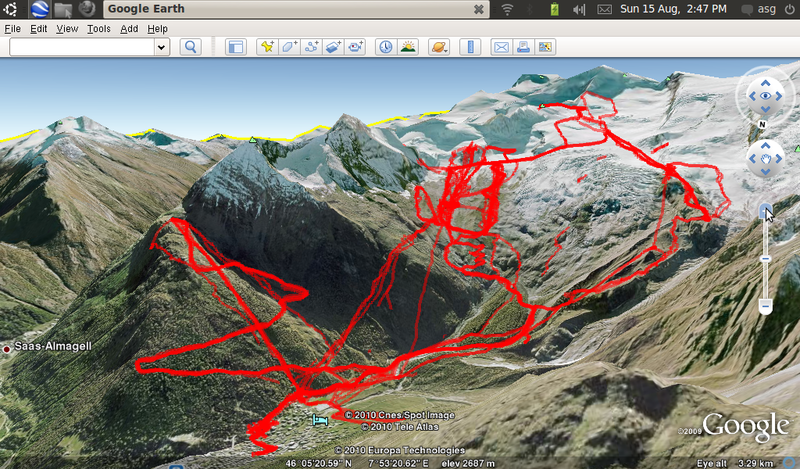 I have now gone through all the GPS data available, and collated it into a single KMZ file. 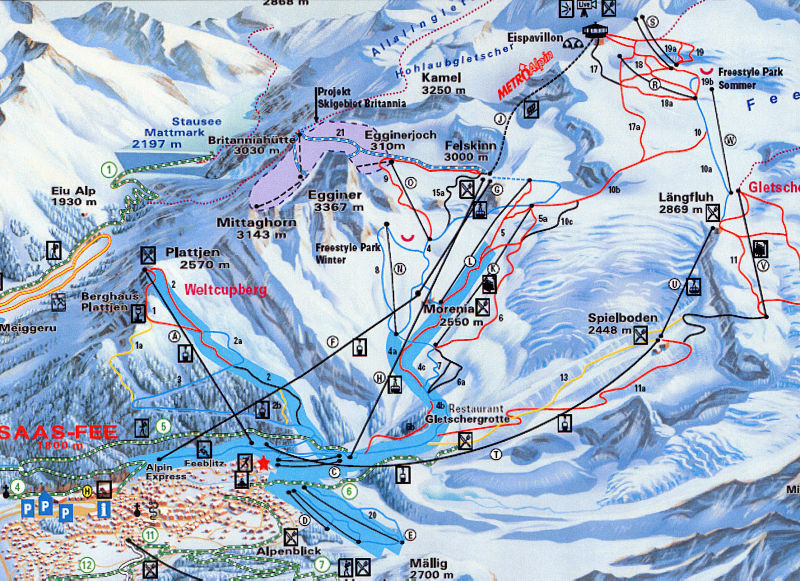 I have split all the tracks into the respective pistes; and lifts, and coloured them accordingly. A screen shot of this data shown in Google Earth is as follows.